First and foremost, the AFL is a fun place to learn the French language. Classes for all ages and skill levels are offered. We also teach classes in French culture and travel skills. Several of these are taught in English. AFL's classes are held at our language center, 173 Sears Avenue, Suite LL079. Click here or on the pull-down items on the classes menu above for school details. 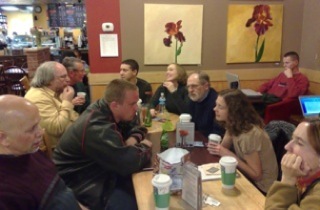 These are informal discussion sessions that meet on the 4th Tuesday of each month at 7:00 PM. These lively interactions will increase your knowledge of France and the French-speaking world, as well as your French language ability. Come to learn from informative speakers, practice your French, or simply to improve your listening comprehension. People of all skill levels are welcome! For more information or with suggestons, contact Dr. Charles Pooser at clpooser@ius.edu. For specific details about the upcoming Club de Conversation gathering, go to the Calendar&News/Quoi de Neuf page and refer to Club de Conversation.